As we are nearing the end of our journey, we are looking at the green spaces on our doorstep, or window sill… If you’re thinking about what to do with your outdoor space this spring, how about making it wildlife friendly or bee friendly. Our pollinators are at risk because of high intensity farming and the use of pesticides – ironically we need these marvelous ecosystem workers to pollinate our food crops! Choose plants that are attractive to bees from early spring to late autumn, as well as some winter flowering plants. Clump them together in sunny places. Avoid plants with double or multi-petalled flowers which lack nectar and can be difficult to access. Recommended garden plants include English lavender, dame’s violet and common jasmine. Never use pesticides on plants when they are in flower. Avoid the use of pesticides generally, by using fatty acids or plant oils and extracts, and other natural deterrents to unwanted critters. Marigolds for example are easy to grow attract many beneficial insects that protect your garden. British wildflowers, such as common honeysuckle, large thyme and wild marjoram can be attractive pollinating insects. Encourage bees and other insects by providing nest boxes with hollow tubes, hollow plant stems or by drilling holes in a block of wood. 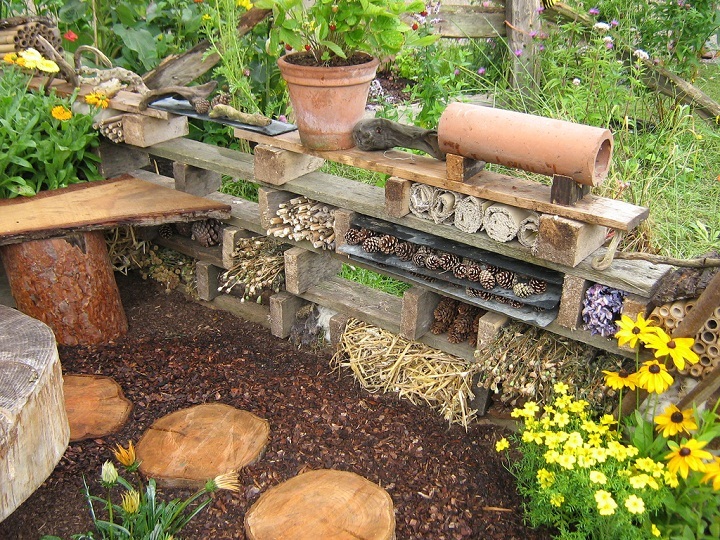 A great opportunity to recycle and re-use materials for this: old pots, air bricks, hollow canes and pine cones. I have a particular soft spot for honeybees: one teaspoon of honey is the fruit of a life’s labour from one single worker bee. In addition to all its antibiotic, antibacterial properties, a local honey can also help to reduce hay fever symptoms as it acclimatizes the immune system to indigenous pollen. However, if you’re not a fan of bees, why not try a wildlife garden instead – Cheshire Wildlife Trust have lots of tips and diagrams to help you plan a hedgehog friendly patch, in other words the best garden ever!